This is possibly my all-time favourite cheesecake, and I’ve made a fair few in my time. 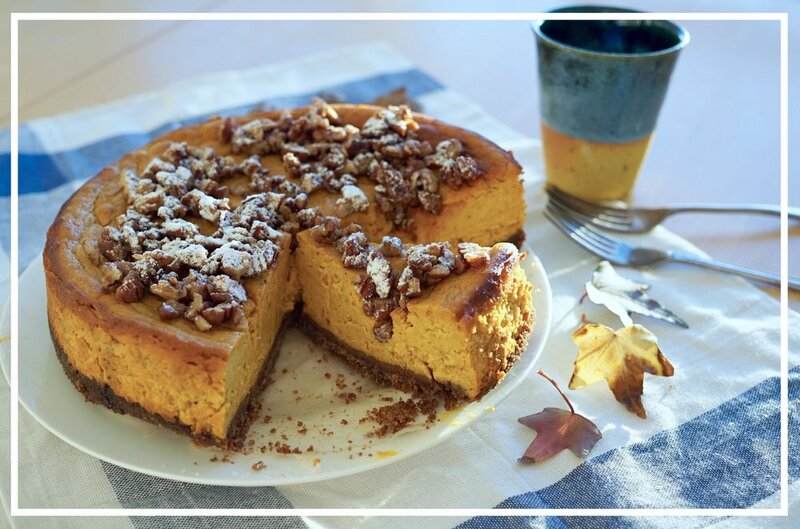 It combines the silky depth of pumpkin puree with warming autumn spices, sticky caramelised pecans, the butterscotch notes of maple syrup and, best of all, a crunchy biscuit base flavoured with Bluebird’s luscious warming Spiced Pumpkin Pie blend. You could use a chai tea, or another spiced tea, or omit the tea altogether, depending on whether you have a spice grinder or not (the tea needs to be finely ground). The texture is the absolute dream cheesecake texture - fudgy, rich and fluffy. You can use canned pumpkin puree, but it’s very easy to make your own – simply cut a medium pumpkin or squash into wedges, remove the seeds and fibres, and roast in an oven at 200C until completely tender. Scoop the flesh away from the skin, put it into a food processor (discard the skin) and blitz to a puree. Drain through a sieve lined with muslin for a couple of hours (or overnight) to get rid of excess water, then use in recipes or freeze to use later. Pre-heat the oven to 180C. Grease a 20cm springform cake tin with butter and line the base with a circle of greaseproof paper. Grind the tea, if using, in a spice grinder or pestle and mortar to make a fine powder. Blitz the biscuits in a food processor to fine crumbs. Mix the biscuits with the melted butter and tea, then press into the bottom of the cake tin with the back of a spoon. Bake for 10 minutes, until golden and crisp. Remove from the oven. Turn the heat down to 160C. Place an oven tray of water at the bottom of the oven, then put the cake into the oven (on a shelf, not in the tray of water!). Bake for about an hour, until it has mostly set but still wobbles a little in the middle. Remember that it will set more as it cools, so you don't want it to be completely solid. Leave the cake to cool in the oven with the door ajar (this helps to stop it cracking), then take it out of the tin and put on a plate. For the topping, heat the butter in a frying pan over a medium heat. Roughly chop the pecans, then add to the butter. Fry for a minute, then add the maple syrup. Fry for another couple of minutes, until the pecans are sticky and fragrant. Tip them over the top of the cake. Put the cake in the fridge and chill for at least 4 hours before serving. Dust with icing sugar to serve.